Gaius Julius Verus Maximus was the son of the Roman Emperor Maximinus Thrax and his wife, Caecilia Paulina. Maximinus appointed his son Maximus caesar around 236, but he held little real power. Both were murdered by the Praetorian Guard in May 238, during the Siege of Aquileia in the Year of the Six Emperors. 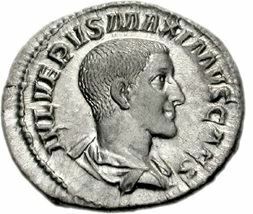 In contrast to almost all other 3rd century rulers, Maximus is more common in bronze than in silver. Neither metal is particularly common, however.